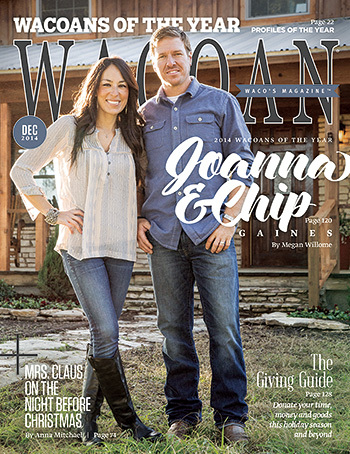 They live in Waco, Texas, but Chip is originally from the Dallas area, and Joanna was raised in Kansas. Her family moved to Waco when she was a Junior in high school. They both attended Baylor University but didn’t meet there. Chip studied Business Administration and graduated in 1998. Joanna got her degree in Broadcast Journalism in 2001 and interned for Dan Rather at CBS News in New York. Joanna’s father owned a Firestone store and she starred in some of the TV commercials for it. She met Chip when he took his car in for service, saw her working behind the counter, and said, “Hey, you’re the girl in the commercials!” They dated for a little over a year and were married in 2003. One of their earliest projects was opening Joanna’s retail store Magnolia Market in 2003. She had no interior design training or experience when she opened the store. She says she learned on the job while helping her customers decorate their houses. They’re moving to a new location with more space this year. They purchased 2 1/2 acres in downtown Waco that comes with a big barn and a couple of silos. The industrial barn on the property will be the new home for Magnolia Market, which will more than double the amount of space the store has. Joanna plans to host a new monthly trade days market with a variety of vendors in the barn, too, as well as workshops and other events. Chip and Joanna have been renovating houses together for over a decade now. When they were first married, they flipped houses. When the housing market changed, they started remodeling them for clients instead. Magnolia Farms has 40 acres with more than 60 animals on the property — chickens, goats, cows, turkeys, horses, dogs, you name it. It’s hard to imagine they get much of that! They come in four floorplans: The Retreat, The Cottage, The Villa, and The Residence. “I literally met Chip at a gas station, and the rest is history. Chip helped me get my tools from my storage unit with his truck because I didn’t have a way to get them. Harp Design Co. recently opened its own showroom where fans can purchase furniture from the Magnolia Farms collection. Viewers pay attention to what Joanna is wearing and want to know where they can buy everything from her boots to her earrings. You can find some of her jewelry at Magnolia Market online, and she gives her fashion tips and sources here. Joanna is known as “The Magnolia Mom” on Facebook because it was the original name of her blog, which she still updates regularly. After each episode, you’ll find details about the featured houses there, including links to her online store where you can buy some of the furniture and accessories. 1. How can you get on the show? A Magnolia Markets employee says it’s a “long, lengthy process.” You have to “pitch” your family’s story with photos and a bio and have at least $30,000 to put toward the renovation. You also might have to wait a while, something not everyone is able or willing to do. If you live in the Waco area and are looking to buy a home that needs renovations, visit High Noon Entertainment for contact details. 2. What happens to the rest of the rooms in the house you don’t see on TV? Joanna says, “At times, we only work on rooms that are of priority to our clients and that work within their budget. Some homeowners want to finish off their other rooms on their own since it is mainly cosmetic (paint and carpet). 3. Where do all the things she decorates the houses with come from? She says, “Many of the products I use come directly from Magnolia Market, my boutique located in Waco, TX. I use a lot of my faux florals, vases, and architectural pieces (you can find many of these items in my online store). I like to incorporate pieces that the homeowner already has when I can. In other words, they can purchase the things they want to keep. She often features the items in her online store if you want to buy something from the show. 4. Are the numbers listed on the show real? 5. Do the homeowners pay for the renovations? 6. How did they get their own show on HGTV? 7. Does Magnolia Homes travel outside of Waco, TX to renovate homes? 8. Joanna gets asked a lot about her ethnicity. What It Was Like to Be on "Love It or List It"
Love them, love her decorating style, and love their show. Thanks for the info! I love them and their show! they definitely need some new episodes. I’ve watched some of them 3 and 4 times! I love the chemistry between. Chip and Joanna and love that they feature happenings around their farm and in life their adorable children! This is my favorite show and I love Joanne’s style of decorating. they are naturals for television and. Chip is a hoot! He cracks me up! Love the show, and I think Chip could branch out and do a ‘how to treat your wife well’ series that should be required viewing. I just wish, in the episode in which they got their kids horse trained, they would make the kids wear helmets, if not all wear them. I know helmets aren’t the norm in Western disciplines, but TBIs happen to anyone, regardless of their saddle. Thank you, thank you for profiling Chip & Joanna Gaines and their series “Fixer-Upper”. Lots of interesting facts about the couple and their series. This is by far the best show on HGTV. They connect so well with one another and the homes they transform are just amazing. I love the way Joanna has to rain in Chip when he gets a little crazy. I haven’t seen one house yet that I wouldn’t want to live in! You finally answered one of the questions I had about the furnishings and how that works. Many people thought the furnishings and décor were included in the purchase price but I always figured the furnishings were optional and additional. However, Joanna’s styling skills are so awesome I would have to purchase it all!! I adore them and their show. One episode, I couldn’t stop laughing at Chip’s antics, which is not like me (unless I’m on a sugar high). Love her style, both personal and design-wise. My husband and I love this show – I especially love the interactions between the two of them. The BEST show on HGTV – I love that there is no fake fighting, so much so, that I can no longer watch Love it or List it. Chip is a riot – I still can’t believe he ate that dead cockroach for 50 bucks. I love Joanna’s style and even though I personally don’t care for distressed stuff in my home, she makes everything come together – the finished product is always warm and welcoming. I hope they have more seasons to come. HGTV – have more shows like this please (without all the fake drama)!! Ditto on everything you said. I hate distressed anything (I always just want to clean it!) but from afar I can appreciate the look she’s going for! And Chip kills me! The fakeness on Love It of List It and Property Brothers makes it impossible for me to watch anymore. Thank you for featuring Fixer Upper! I do love watching their show. The best part is that my young daughters can enjoy it with us without our having to worry about content. That is so rare these days. One thing that I love is how the Gaines’ bring those older ranch houses into the 21st century on the exterior. I really think that is significant. Many of those homes have mature trees and landscaping. The neighborhoods that have tons of those kind of mid-mods can be made really beautiful for another generation. Thank you also for giving us the info on how Clint Harp came to be involved. Clint is so talented; I loved that desk he made for Chip. I also like how Joanna’s design background is from her store experience. It makes what she does quite accessible and more personal. When our family from Cincinnati comes in for “Girls Week” we always stop and eat in Waco near the new Baylor stadium on our way back from Round Top’s Marburger Farms Antique Show. I cannot wait to pop into Joanna’s shop this time when we go! I am also pleased that Waco is the other star of the show; she deserves some glory. Julia, your blog is the best fun! Thanks for spending time here! Wow, Julia, you really dug around and got tons of information on the show and answered some questions I have (#1 being what they do with all the furniture they stage the house with). I just love them and their family and the life they’ve built for themselves. It’s definitely an enjoyable hour watching their show! It’s one of the best reality shows on TV. So much is fake and you can tell that they’re just two real people who love what they do. HGTV is just there to film it. Joanna’s style may not be for everyone, but why would you hire someone who’s style you didn’t like? They make great TV and beautiful homes. They’re the only show on HGTV I can stand to watch anymore. I never miss an episode. I am like a junkie when it comes to this show. I have seen every show two or three times! (get a life) I would consider moving to Waco if I was promised these two would could find me home and fix it up. I love those shirts they have on! I wonder if I wore that shirt around my tiny community in California, anyone would get it. Shiplap? What the hell? Regardless, yay! Love learning more about them, their process, and the houses they’ve designed. Off to read the other links! They sound like a pretty busy family. Very talented couple to keep such a schedule! Love the information you found regarding the couple of Fixer Upper. Think her style is wonderful and the transformations of the houses incredible. I don’t miss that show! I love their show also. This weekend they will be in Cleveland, Ohio for a remodeling show. My husband and I plan on going to see them, Jeff Lewis from flipping out will also be there. Can’t wait to meet them all. I did get to see them in Cleveland and they are just as they are on TV. Super funny, and very entertaining and just a nice down to earth couple. They told the story of how they got together, and some of their earlier years getting started. Huge standing room only crowd waiting to see them so was lucky to be one of the ones who got there early to get a seat. That in itself attests to their popularity. They answered every question that was presented to them honestly and with humor. You can tell they are just genuinely nice people, taking extra time at the end of the show for pictures. Theirs is the only show I watch on HGTV and I love it. The transformations are pretty remarkable and the budgets so reasonable. I had wondered about the pricing, which they say is real. I had thought it might not include their labor or fees since it was on TV, though I’m sure labor and pricing in general is lower in Texas than many other parts of the country. I would love to have a master bedroom/bath addition for the price they had on their last show! I had wondered whether Joanna had design training, especially when she uses the 3-D CAD software to show the clients her design ideas. I’d be curious if she does that herself or if she has someone else draw it on the computer for her. I gave up trying to learn it and went back to the drawing board, literally! Joanna definitely has vision and a gift for decorating, and fortunately she has a husband who can tell her whether it’s feasible or not (those pesky supporting walls!). They make a good pair, and it’s always important to have a husband who can make you laugh. Every house they’ve done, I’ve loved. Even the more modern one they did just a while ago – modern is not at all my style and I fell in love with that house and the style. I want them to stay forever. You know the show is good when my husband says, “Hey, let’s move to Waco and have them do a house for us!” Believe me, I’m crazy enough about them I might consider a move to Waco- along with the rest of the nation at this point! ;)Their show is a favorite (and the all-time best HGTV show in my opinion): no manufactured drama, no cheesy scripting, just hard work and true talent. Even my husband and teenage son will sit down and watch it with me. As much as the work they do is compelling, watching them as a couple is just as much fun. They truly seem like they would be a dream to work with, and the fact they have subcontractors willing to follow them anywhere is an indication they are. It’s wonderful to see nice people succeed. I love this show! I found it one Saturday while is was on a marathon. I ended up watching it all day. I love the whole idea of them helping the clients find a house, renovate and decorate. I also love their own farmhouse they show. I can’t figure out how they have time for all these businesses and projects with four kids. A big YES to everything that’s been said here! Great people, great design! Love this show. Thanks for this comprehensive post, Julia. Julia, You are Da’ Bomb for finding out what inquiring minds want to know. This is a favorite HGTV show of so many people. Both men and women seem to enjoy it equally. Chip and Joanna are such a refreshing couple with a refreshing style. Thanks for sharing this with us. Your blog is “Da’ Bomb” also! Great people, great show !! Love her taste and ideas on decorating. Lots of ideas on how to save money and how to make your home your own and not a cookie cutter home. Enjoyed this post about how they got their start. This is the only show that we watch on HGTV. ( Yes, my husband enjoys watching it,too.) I had stopped watching HGTV the last 5 years, or so, because the shows were not to my taste anymore. I saw a lot of positive reviews of Fixer Upper and decided to give it a try. I am glad that I did! Chip and Joanna’s personalities & talent make this show enjoyable. Thank you for this post. It was fun to read some background info. I love this show. It’s my favorite on HGTV. Chip is hilarious and Joanna is a natural at what she does. Every house she renovates, I want to live in! The chemistry between Chip and Joanna is perfect and that’s part of the show’s charm. Their personalities draw you in and you can’t stop watching! The kids are adorable. I love that they show their life on the farm. You can tell that they love what they are doing. I love some of the unusual objects that she uses to decorate because it makes you look at things in a different way. I love going to antique shops and junk stores and Joanna helps me look at objects in a new and fresh way. She is my decorating inspiration! I am also a big fan of their show. It’s nice to see everyone get along, instead of all the fighting and nastiness that has taken over some of the HGTV shows. I love her style, especially all the antiques and distressed finishes. The mid-century modern was not my style, but I have to admit they did it well. Her clothes are adorable, but I’ve wondered this season if she has gotten pretty thin or if it is just my imagination. Their garden homes are gorgeous and I wish they had a community here in California! I would bet their children’s names will soon be on the popular baby name list. I love watching the show and I am almost 56!!! LUV this show. It is my favorite on HGTV. Not too many shows have the chemistry between Joanna and Chip. Joanna is so pretty and Chip is sorta goofy but I can tell, Chip worships her. They always do a perfect job and make the place elegant and classic, beyond my wildest expectations. Joanna always makes sure the homeowners are included in the design unlike some of the other shows. Sometimes, I cry with the homeowners, when they show the final reveal because it is so beautiful and their emotion of appreciation and gratitude so genuine. I like how they have fun when they work and also like to see their kids play with the animals on the show. When they show the baby animals, my heart melts even more. Just like everyone else – LOVE THIS SHOW! HGTV needs to take a cue from the popularity of this show that we need more like it and less of the really fake shows and shows that have the hosts bickering, the drama, etc. We all wish Chip and Joanna could come do our houses! I can’t believe she has no interior design background – no experience before they started flipping. How cool! Definitely can’t wait for season 3 and definitely want to visit Waco now! since dad owned a firestone auto repair center is that where they got their initial financing? Joanna interned for dan rather, what did chip do? Tthey are planning on opening a 37 house gated community! Usually a developer/developing company does that! I may give this show a chance but it seems like another show of rich people getting richer. They started by buying a really cheap fixer-upper after they got married, doing most of the work on it themselves, and selling it at a profit. Chip started in the landscaping business, and you can see that influence on the show. I read that they plant a magnolia tree in the yards of each house they work on. I think the Chip and Joanna are almost singlehandedly responsible for that. There is building/renovating going on all over this town and the vibe has completely changed. The only negative is that Waco now has the hottest property market in the country and prices are rising very fast and properties in the $100k-200k range are selling in days (as opposed to the months it would take when we first moved here). The mid century modern they did a couple of weeks ago is just down the street from our house and the Victorian they showed last night I pass every day (it’s still vacant and crumbling by the way). One thing to consider is anyone is actually serious about relocating to Waco, the schools here are terrible (which is why you see so many of the properties in Woodway – good schools there). It’s so interesting to hear you say that, Elizabeth, because my husband and I were talking about the housing prices in Waco last night and how they probably aren’t going to be that low for much longer. I read that a lot of people want to move to Waco now because of the show, and I can imagine that any of the houses Chip and Joanna worked on would be in high demand. Thanks for giving the “local” perspective! P.S. Loved that Victorian they showed last night. Too bad it needs so much work but the exterior is beautiful! I’ve lived In Waco almost all my 65 years. I agree with you that for many years Waco seemed to be a dying town. I would have to disagree that the recent growth and resurgence in the downtown area is almost single-handedly because of the Gaines and Fixer Upper. The successes that Baylor University has experienced in their athletic programs, most notably football and women’s basketball but extending to programs like golf and their equestrian teams, have also played a large part. And the recent addition of the new state of the art McLane Stadium is definitely the impetus for the rebirth of restaurants and entertainment businesses in the once vacant and decaying downtown area. The Gaines are terrific, love their show and the fact that people for sure come to Waco to see the homes they do and to go to Magnolia Market, but it’s unrealistic to give them all the credit. I totally agree with Marsha – I have lived here for almost 55 years – born here – while the Gaines have played a part recently, they can not be credited with single handedly changing Waco. Actually, in my opinion, Baylor, RG3, and the basketball programs, started the change (before the Gaines were ever known). Marsha is also correct in that McLane Stadium totally changed down town and the whole IH 35 area in Waco. I too like Fixer Upper but everyone that wants to move here, should check out school districts and neighborhoods. Some of these homes are in high crime areas. Thanks so much for this! We don’t have cable so all our “TV” viewing is via the internet and dvds. This is the only show I’ve ever followed since we cut the cable off 14 years ago – I love it that much!! We’ve bought both seasons on Amazon and each new episode is dropped in our video library on Wednesdays. I’m already dreading the end of this season and the long wait for season 3. There are a ton of old turn of the century house available in Waco for a steal, but you have to be willing to be a trailblazer. Those houses are in scary neighborhoods and feed into dismal schools. I have faith those neighborhoods will turn around and return to their former glory, but it will take more than a few brave souls to accomplish it. I knew as soon as they showed that glorious Victorian last night that couple would not take it on. They wanted Woodway (which is admittedly nice ~ lots of trees, big 70s ranches ripe for renovation and great schools) and that Victorian is on Colcord Ave – a not nice street in central Waco. By far the best show on HGTV! Fun and NO drama! I love her decorating style, interesting that she had no formal training. Love how they play off each other too. I hog the big TV in our family room when there’s a new episode on and send my hubby to the bedroom to watch whatever he wants! I too loved the Victorian last night and would have loved to see how that turned out! Glad to hear they will be back for another season! I like the show better than most on HGTV and it’s great that they’re bringing back old homes and neighborhoods one house at a time. My only problem is that they turn almost every home into an open concept and practically gut them. I think I said this before, but I really with they would watch rehab addict or take a look at retro renovations website, so they would get an idea of how to bring back the homes former glory without destroying the integrity. I agree with Rue – I’d like to see ‘before and after’ without SO much gone! But I know that’s not the type of show it is . . . I would also like to see them give salvable stuff to a Habitat Humanity store. I wrote the show suggesting that – and I bet other people did also. Such a fun show to watch and a sweet family . . . I forgot to mention that too, Karen! I completely agree about donating the stuff they take out. They seem too happy to destroy it instead. Love Chip and Joanna but the show is getting too predictable. Tear down a wall, put in an island, have Clint build a table and then find some expensive problem to confront the homeowners about. If they weren’t so likable I probably wouldn’t watch anymore. Agree with this, also need a break from all the shiplap and subway tile. Hands down, the absolute best show on HGTV and the only TV show besides sports that my husband will watch with me. I am always amazed at the amount of renovation work they do for such a low budget. Here in CT just one small bath total reno will cost about $35,000 and kitchens are ridiculous. Just to cut down a tall oak tree is $1000. So when I see them put in gorgeous kitchens with all new appliances, stunning baths, all new paint, wood floors and tile, windows, hvac systems, knock down walls, new exterior and landscaping for under $100,000 , it makes me want to pack up and move to Texas!! You guys are great, your show is delightful, and as a fellow Texan, I find your style charming and familiar. Keep up the good works! I love that you have your kids near, and find time to have dinner together.. I can appreciate the higher value system this represents. My hat is off to you! Love HGTV, but this is my absolute favorite show. Joanna is extremely talented and her style is pure genius, both personally and professionally. Chip is a gifted carpenter who appears ready to tackle any project: his work is impeccable and he looks great in a cowboy hat! Very much looking forward to the next season of Fixer Upper! We are not seeing any episodes of FIXER UPPER???? Why? What happened to their Tues. slot??? Has been several weeks now……we ONLY like Fixer Upper….the other shows are just too phoney or boring!!!!! What is going on!!!!! I’ve been missing them, too. I hope they haven’t run out of Season 2 episodes already and will return with new ones soon. I do know they’re shooting Season 3 right now, at least! I love this show. They are very heartwarming people and do great work. I wish they were in my home town. I absolutely love the show Fixer Upper and am perplexed at the seemingly short season. Is it because of the scope of what they do or is it hgtv decision to shorten their season? We need more shows, I miss seeing them. Absolutely love this show. It’s perfect n so much fun to watch. Love the chemistry between Joanna ????n???? Chip. This is real love shining through. Wish I didn’t live so far away..it would be fantastic to meet them in person. Thank you HGTV for allowing them to be real!???? awesome show!! Stupid spell check. ??? ?Question marks should be exclamations !!!! ! ! ???? I love Chip and Joanna’s personalities . Besides the incredible work they do. I could watch their show for hours, and often do. I love everything about this show! I really enjoy watching the way Chip and Joanna interact with each other. I have never seen an episode where I did not love everything they did to a house. Fixer Upper is my favorite!!! It just has a more “real” feeling than the other programs. Though I do rank Flip or Flop and Rehab Addict in that category of more realistic. What I am curious about is who takes care of their 4 children while Chip and Joanna are busy with their 4 enterprises??? We need more programs like this. Would love to find out where I could purchase four of those beautiful wooden rockers with the vine/twig-like look that are seen on the front porch of the Magnolia Farms house! We love Fixer Upper and can hardly wait for new season!! I really want the Magnolia wreath but unable to find it,may have to make it myself! Hope the Gaines family is safe from all the bad weather!! Donna Gullikson Federal Way Wash. I love, love, love this show, so fresh! However, I do have a suggestion, change the script from time to time and let “want to see your house” rest! The want to see question is getting old. Love this show–chip and “jo-jo” are such a unique couple. Love the designing and decorating of the homes. The first time I watched their program, I was channel surfing and I heard her say the word ” y’all!. I have been hooked ever since. Oh, Chip it’s either square footage or square feet, not (square foot) when it is more than one foot, okay? You guys are blessed!!! Looking forward to watching your next series! I love this show and watch it quite often. However, on one of the commercials they tell us they are a complete package so you don’t have to go get a realtor. I am a retired realtor and wish the word would be pronounced properly. It is real-tor, not real-a-tor. love your show, When will you be in Ga? I really love the show Fixer Upper with Chip and Joanna Gaines. They are a great couple, very down to earth, modest, humorous and they have a great family, not mention that they have great taste in decorating. I am originally from the south and enjoy listening to them talk and tease each other, as this reminds me of how my parents were with each other as I was growing up. I feel like part of their family when I watch them. Chip really cracks me up and Joanna is good about keeping him straight. Keep up the great work and love for each other and family, don’t let the spotlight take that away from you all. I hope God blesses you both and your family now and always. From G. Khirfan school librarian in Michigan. My husband and i love youre show… We wish you guys would be able to do our new home but we live in california. I love the show and the interaction between Chip and Joanne, I also wish they could visit and renovate our home, but I guess Ballarat, Victoria, Australia might be just a bit too far to travel ! Thank you for time, and thank you fon such an amazing program..
It’s so much more entertaining than the other “shows,” and I love Cip and Jojo.. You can see how much love they have for each other, plus I cannot stop laughing through all the of the episodes. Chip is hilarious!!! Love the show, wish them nothing but the best! I like the show but could they please stop saying “you guys” so often?! And “you guyses” makes me cringe. Love the show. Love the remodel’s. Wish I lived in Texas so you could do my remodel. The homes you make over are taken from OMG what were we thinking to fantastic. Watching the two of you is always enjoyable. Your playful, humble and just so down to earth. Should you ever consider a home in California for beautification, I am all in. You have fast become my favorite Sunday morning indulgence. Absolutely my favorite show. I only watch HGTV now because I love this couple and every single one of their shows. I began to hate HGTV because they do not teach you how to do anything anymore like before. House hunters shows is all they show plus the boring two brothers, really? It is all about DIY now and Chip and Jojo. I am so ready to move from Alabama to Waco just to be a part of the decorating experience they offer. I love her ideas. God bless them and their family. Please help 624 Preston, Columbus Tx…. I wish they would fight more with each other. They seem really unhappy and I wish they would show the “real” them. I love your fixer uppers! And you two are most adorable couple and have fun with each other!!! !while working together! Can you please come to Boca Raton Fl?! For a special show? Geri and I just watched your show for the first time and enjoyed a fun filled Saturday morning. Your designs and follow through interpreting what your clients want is spot on. It is so refreshing NOT to hear how pressed for time each project is. The addition of the children on the show is a big plus. The humor is a welcome relief. Keep it coming as you have 2 new committed viewers.